Here we are again, rapidly approaching the heat of the summer and preparing to enjoy the things we love about Hilton Head Island. With all the fun of summer comes the beginning of the 2014 hurricane season. June 1 is the official start of the Atlantic Hurricane Season, which goes through November 30. Even though we have been fortunate in the past, we must continue to prepare for the possibility of a hurricane impacting the island. 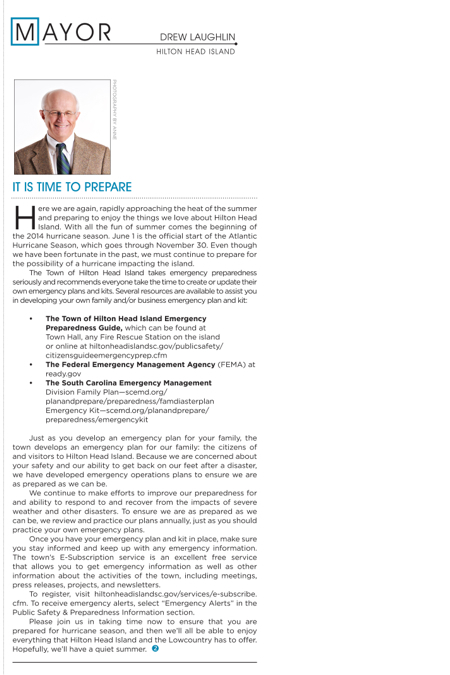 Just as you develop an emergency plan for your family, the town develops an emergency plan for our family: the citizens of and visitors to Hilton Head Island. Because we are concerned about your safety and our ability to get back on our feet after a disaster, we have developed emergency operations plans to ensure we are as prepared as we can be. We continue to make efforts to improve our preparedness for and ability to respond to and recover from the impacts of severe weather and other disasters. To ensure we are as prepared as we can be, we review and practice our plans annually, just as you should practice your own emergency plans. Once you have your emergency plan and kit in place, make sure you stay informed and keep up with any emergency information. The town’s E-Subscription service is an excellent free service that allows you to get emergency information as well as other information about the activities of the town, including meetings, press releases, projects, and newsletters. To register, visit hiltonheadislandsc.gov/services/e-subscribe.cfm. To receive emergency alerts, select “Emergency Alerts” in the Public Safety & Preparedness Information section. Please join us in taking time now to ensure that you are prepared for hurricane season, and then we’ll all be able to enjoy everything that Hilton Head Island and the Lowcountry has to offer. Hopefully, we’ll have a quiet summer. Just like during football season, it is invigorating to be on a winning team. Those wins translate into a productive recruiting season which produces more wins. My son Michael, a college sophomore, has the honor of playing football at Auburn University, where he has the rare experience of tasting the winning spirit of a nationally-recognized team. Despite the heartbreaking loss at the National Championship game in Pasadena this year, many rising high school football stars are setting their sights on a team position. It’s nice to be in a place where many want to be. As mayor of Bluffton, I know that feeling, along with our council, staff members and residents. The word is out that Bluffton is a progressive, productive and innovative town, engaging in projects and programs that are attracting local, statewide and national attention. For example, the Bluffton Police Department has been inundated with résumés from experienced officers. Under the contagious leadership of Chief Joey Reynolds, the police department’s reputation is spreading. Besides saving training budgets, experienced officers can literally hit the ground running. That experience pays well for the officer, the department and the town. As college football teams know, the reputation of their coaches sets the stage for their success. As the third vice president of the prestigious FBI National Academy Associates (FBINAA), Reynolds is representing the organization and the Bluffton Police Department in Kathmandu, Nepal at an Asian-Pacific law enforcement conference this month. It’s impressive for the town’s top officer to have an international stage on which to tell part of the world about Bluffton. The success of special teams also contributes to any football program, and in Bluffton, the Don Ryan Center just scored big. The South Carolina Department of Commerce recently awarded the center a $100,000 grant to nurture the region’s start-up companies. This grant will also pay for educational programs extended to the general public. Additionally, the town’s recent “Heart of the Lowcountry” art contest celebrated Bluffton’s new brand and received 52 entries from residents of all ages and skill levels. More than half of the artists donated their paintings, drawings, sculptures and mixed media pieces to help decorate Town Hall. On behalf of the town, we are continually humbled by our residents’ expressiveness and generosity. That’s a win for all. Lastly, as we enter the summer season, Bluffton residents continue to honor the town’s most cherished trophy, the May River. About 250 people joined us for April’s River Sweep and collected more than two tons of trash from our waterways, streets and parks. Last month’s event produced the largest turn-out in the history of the town’s Earth Day/River Sweep events. It’s a wonderful feeling to be on such a great team, and with the enthusiasm of our beloved residents, we will have many more wins to celebrate.